Home/Без категория @en/Quality pellets- what we have to know. Very often the following phrase is abused- quality pellets. It can be found in almost every advert site of manufacturer or dealer that sells this product. In the European Union the quality standards of pellets is determined solely by a European standard (EN 14961-2). Under there is a freedom for manufacturers to choose their pellet quality but also specific requirements for them – length, diameter, ash content, moisture content etc. In 2010 the European Association for biomass producers – AEBIOM creates the brand ENplus. With this step by the Association aim to impose certificate in order to impose control over the entire chain from the extraction of wood to end users. ENplus distinguishes two quality classes A1 and A2. The class A1 introduces the most strict restrictions on ash content in pellets. In class A2 ash content is 1.5%. Industrial pellets certificate EN-B has significantly increased limitations. Why most producers don’t have ENPlus certificate. The reason for this is not so in control that is required by the certifying authority as the more expensive finished product. As the market for pellets in Bulgaria is extremely price sensitive, the presence of such a certificate will increase the value of the pellets with an additional 15-17 lev per tonne for the end user. That would not make the product competitive. What do most manufacturers to achieve better value for the end customer is periodic samples to certified labs that examine performance under the standard. Whenever you buy a pellet pay attention to whether the manufacturer has made such samples when they were made and their performance. Vesta recommends: Always ask the manufacturer or seller certification test control pellets you buy. Good parameters of the certificate correspond with those written on the bag. Does it matter what colour is the pellet? Yes and no. That some pellets are lighter and others darker does not always mean better or worse quality. When it comes to wood pellets, their color depends on the type of wood that is used – whether production technology starts from roundwood or whether waste from the timber industry – carpentry workshops, parquet or furniture factories and others. In many people still hovers delusion that the lighter pellets are of high quality. This is not always true. There are manufacturers that put poor quality wood (covers, clippings, etc.) and add bleaching agents or other types of biomass to improve the color. This is why Vesta recommends – always request a certificate or test control of the retailer or manufacturer from which you buy your pellets. This is the only way to make sure that you buy quality pellets. What pellets does Vesta offer? Pellets of Vesta meet the highest quality requirements covering the EU standard (EN 14961-2) and in particular within the column A1. This means that when using such pellets by us or another manufacturer should be minimized – every 7-10 days. 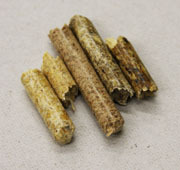 It is important to know that this type of pellets do not form a slag, which leads to a distortion of the combustion process and often to the shutdown of the machines. Practical pellets class A1 can achieve comfort heating equivalent to that of heating gas, electricity, heating oil, but at a much more reasonable price.